Life surprised me last week and it put some aspects of my life on hold, including blogging. I haven't forgotten about you nor this blog that has been very dear to me for the past 2 years. I still have some pending product reviews and a lot of nail art ideas that I need to realize. 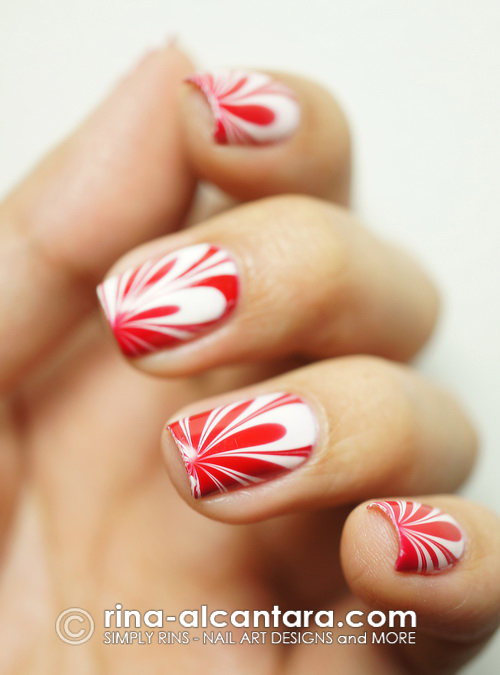 But for now, let me share with you another marble design that I did for a nail art contest that I joined last month. I would have love to win the top prize, but I am happy nevertheless to have won one of the consolation prizes. I named this, Red Splatter. For someone like me who have just recently tried water marbling, I must admit that I'm starting to like it and I can actually see myself experimenting with more designs. I personally like working with 2 colors and I'm practicing on how to be consistent with the design, just like this one. I am also having a good time trying out various techniques on how to manipulate the polishes once they are in the water. The best part of the experience is probably when I was trying out different poses with my Red Splatter nail design. The contest required each participant to upload a beauty shot with the nail design. I wanted the focus to be on the nail art so I decided on a white background, a white top, and I pulled my hair back for simplicity. Light make-up was also a good choice at the time and since I really don't know how to paint my face (really), it wasn't a problem for me at all. It was difficult to create a pose with my hand on my face. But it was the look I was aiming for. It took me a lot of shots before I was able to pick the one I'd like to submit. I now understand how difficult it is being a model. Wow Rins very beautiful. My first attempt on water marbling the other night was a nightmare. I really need to practice more and more. :) This design of yours makes me want to pursue more.. thanks so much for sharing your wonderful works. This is the work that should have won the contest! :-) Your water marble is perfect, so neat, and the colours are beautiful! Oh lovely! I'm usually not THAT into marbleling, but I like this one! Really nice! 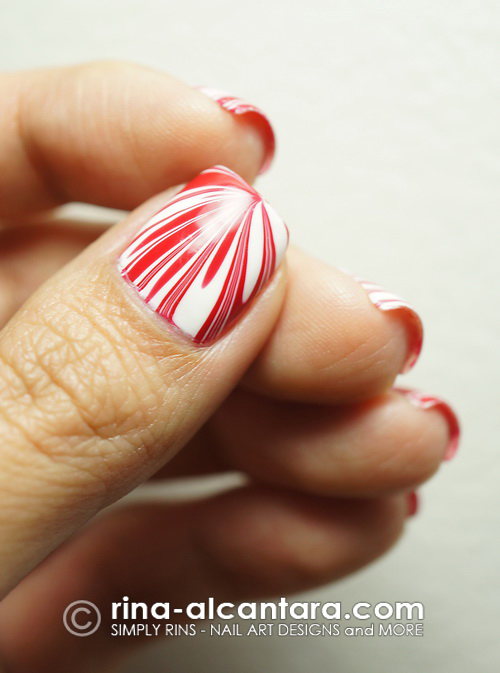 your marbling is perfect !